Bioroids and Bombots: 20mm Micromissiles and Rounds. The 20mm micromissile owes some of its ancestry to an early 21st century South African weapon. The designers of the PAW-20 Neopup had the inspired idea of mounting 20mm cannon shells in a grenade gun casing. The resulting round had a flatter trajectory and higher velocity than larger calibre grenade guns. This resulted in a higher component of kinetic penetration against a target. A 40x46mm grenade would generally explode against a wall or windscreen. The 20mm would penetrate and explode on the other side. On the downside, recoil from the weapon was rather heavy, slowing down follow-up shots. Two technological advances were destined to transform this weapon system. The first was more compact new explosives that allowed for a lighter warhead without compromising target effect. The second was the economical production of high-quality miniature rocket motors. The combination of these two things produced a 20mm projectile with light recoil and an improved performance. The micromissile is mounted in a conventional polymer casing and fired like a conventional shell at a velocity of only a few hundred metres per second. A short distance from the muzzle the rocket motor is ignited, accelerating the missile and imparting spin stabilization. Miniature homing and stabilization systems were to make these projectiles even more potent weapons. With battlesuits and cybershells commonly used in late 21st century conflicts the 20mm micromissile proves a useful weapon against a large variety of targets. The standard launcher for the 20mm micromissile resembles a large-bore box or drum-loaded shotgun. Launchers designed to be mounted on SMGs or rifles resemble double-barrelled shotguns. It was not long before shotgun-like rounds for the 20mm micromissile launchers began to make an appearance. This was a logical development given that 20mm is just slightly greater than 10 gauge. Compared to the 12 gauge shotshell the new 20mm rounds offered an increase in capacity. Rounds made for a 20mm could not be fired in a 12 gauge so dedicated military rounds could be made in 20mm with the knowledge that they could not be fired in civilian weapons. On the other hand, it was still possible to fire 12 gauge and 10 gauge rounds from the 20mm by changing the barrel or fitting shells with an adaptor band. A typical 20mm assault launcher rather resembles a PPSh-41. It takes a drum or box magazine and has a barrel about a foot long. A double-barrelled launcher designed to be mounted on other weapons is also produced and often a pair of these may be fitted together. Such launchers may be fitted with a grip or stock to produce a weapon that looks like a sawn-off shotgun. A variant of police armgun combines an electolaser with four 20mm barrels. These may be loaded with a variety of LLW loads and a homing anti-personnel micromissile. The development of both micromissiles and shotshells for the 20mm greatly extended its versatility. The 20mm was capable of providing both lethal and less-lethal firepower. Military 20mm micromissiles have a velocity of 320 yards/sec. LLW loadings may be designed for lower flight speeds. SAPHEI. A number of warhead types are possible in micromissile format. Hollow-charge warheads are regarded as an unnecessary complication in such a small calibre. The warhead most commonly used is classed as a Semi-Armoured Piercing High-Explosive-Incendiary which is versatile against a large variety of targets. 6d x 2 pi ++ linked 2d+1 [2d] cr ex. Nanodrug/Biochemical /Chemical. (NBC) A 20mm rocket or shell can hold 1 dose of a nanodrug, biochemical or chemical agent. This will cover 1 hex radius. Lasts 300 seconds divided by windspeed in mph. Being of a low capacity 20mm rounds are seldom used for screening agents such as smoke or prism. Nanoburn. 20mm rounds are too small to carry a cyberswarm. They may be used to carry one dose of nanoburn. See TS 3e: p.158 for nanoburn effects. Solids: TP (Training/Practice) microrockets have neither guidance systems nor explosive (some do create a flash as they impact the target). They are blue-coloured so troops call them blues or inerts. TP rounds may also have reduced fuel rocket motors for firing ranges where distance is limited. Inert rockets can still be used as potent anti-personnel weapons or cause damage to objects they are fired at. Police departments use inerts as a high stopping power round to take down dangerous aggressors. Such police rounds may be guided. They may also have fast burn rocket motors to limit their range and increase close range effect. TP: 6d pi++ Non-homing. Other stats as standard although maximum range may be reduced. Police Solid: 8d(0.5) pi++ Usually guided. Other stats as standard although maximum range may be reduced. May be programmed to plunge into the ground if it overshoots its intended target. Ferret-20 Chemical Round. 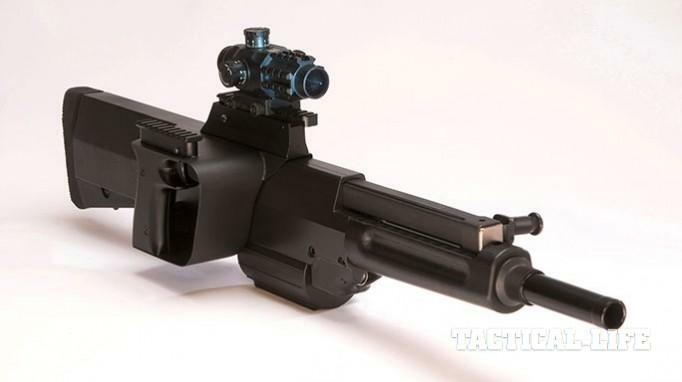 The Ferret-20 can be fired to penetrate through a window pane, windscreen door or light wall. It will then eject its cargo of chemical inside a room. 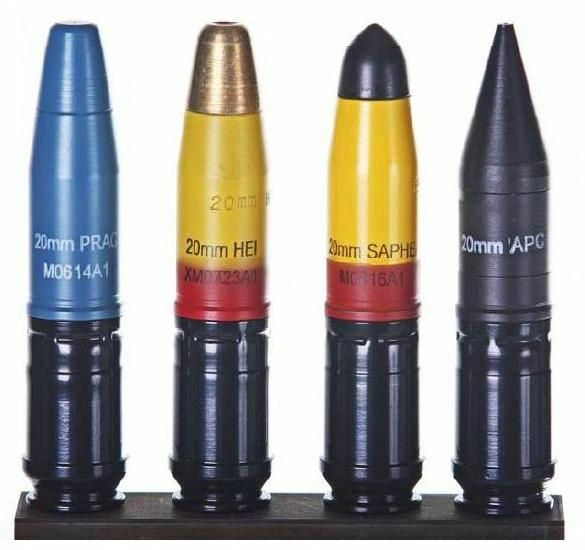 It is equivalent to the 20th century Ferret-12 rounds but has the advantage of larger capacity, better penetration and a smart guidance and fusing system that can allow for the barrier offering greater or lesser resistance than was expected. It can also be used against targets in the open by being set to airburst. Construction is mainly polymer to minimize fragmentation risks. Ferret-20 is usually used to deliver Riot gas. Riot gas has a 4-yard radius cloud lasting 20 seconds. Riot Gas: Any living being within the cloud who breathes the gas must make a HT-4 roll to resist every second. If the roll fails, they are nauseated [p. B428] for as long as they remain in the cloud. If it fails by 5 or more, they will become violently ill, retching [p. B429] for as long as they remain in the cloud. After leaving it, they will be nauseated for minutes equal to their margin of failure. For other fillings treat as an MBC round. Shockroc. Shockroc is a less-lethal round fired at a relatively modest velocity. Speed 170 yards/sec. Range is 150 yards. As it approaches its target it opens out into a cross shape, slowing the round down (hence the alternate name of Shockstar). On impact the shockroc releases an electrical charge through its arms, producing effects similar to an electrical stun-gun or taser. Shockrocs are homing and can be programmed to plunge into the ground without discharging if they overshoot their intended target. The projectile sensor records and transmits time-stamped images of the target for evidence. A hit from a Shocroc inflicts minimal damage (1d-3 pi-). The target must make a HT-5 roll or be knocked down and paralyzed. See Nonlethal Electrical Damage [p. B432]. An afflicted victim remains incapacitated for 5 seconds and cannot intentionally remove the projectile during this time. They continue to suffer the weapon's effects for (20 - HT) seconds after the current switches off (minimum one second). After that, they may roll against HT each second to recover, at a penalty equal of -5. Note that a stunner's electric current may start a fire if the victim is covered in flammable liquid. Shocroc MagPlus is intended for large animals or similarly tenacious targets. As for Shocroc but delivers an 8 second discharge and requires a HT-10 roll. Non-rocket rounds for 20mm micromissile launchers are generally called shells or slugs, depending on type. Canister: The 20mm equivalent of a shotshell, the canister is a close range lethal round containing two sizes of buckshot mixed with birdshot. This load is effective against unarmoured targets and useful against small, fast-moving targets such as reconnaissance minbots. Against better armoured targets it is still effective against vulnerable parts and the distraction can buy enough time to allow a unit to bring heavier weapons into action. Breeching Round. This is a cylinder of soft but dense polymer. It is used to destroy door locks and hinges with minimal risk to the firer or occupants of the room. Fired against living targets it counts as a large-calibre frangible round. Gelshot. A composite projectile formed from polymer and a sponge-like synthetic. The gelshot is a less lethal kinetic energy impact round. It should not be fired at the head. Weapon AI may be programmed to prevent the user aiming at the head when gelshots are loaded. The round may contain a small capsule of marker dye and/or malodourant. Tangler Shell. An unguided, non-rocket 20mm tangler round. Affects a single target at ST12. Rules as TS 3e: p.159. Rubber Shot. A less lethal round, this is effectively a canister round containing 8mm polymer balls. The round is fired at the legs of mobs or at the ground before them to deter them or channel their movements. When skip fired (shot at the ground) modify the roll to find hit location by +2. Muzzle Duster. A less lethal chemical round for very close range, the muzzle duster shell contains a finely-powdered irritant and a small propellant charge. The muzzle duster projects a cone of irritant chemicals, 10 yards long and 4 yards wide at maximum range. Anyone within the muzzle duster's discharge cone at a range of 4 yards or less makes two HT-4 rolls: one to resist coughing [see Afflictions, p. B428] and another to resist blindness [p. B124]. At ranges greater than 4 yards these rolls are made at +1 for each extra yard of range, so at 8 yards roll is against HT, 10 yards roll against HT-2. Breathing apparatus and sealed eyewear will provide protection from the irritant. Looking away from the blast will not- the powder is very fine and gets everywhere! The 20mm HESH slug is simply malleable explosive and a base-mounted fuse. It is a cheap and effective round for close range engagements against armoured targets. Many scouts and pointmen load their assault launcher with a mix of canister and HESH when operating in close terrain. If both kinetic and explosive damage fail to penetrate DR the blast may produce spall on the opposite side of the surface struck. This works just like a flat charge [HT (4e):p. 183]: it inflicts cutting damage equal to 1/10 the maximum explosive Damage (as for any contact explosion; see p. B415) resisted by 1/100 the target's DR, rounding up in both cases. These special rules don't apply against laminated armour [p.HT (4e): 229]. Flare rounds used in 20mm launchers are invariably 12 gauge flares fitted with an adaptor. These are simple signal flare rounds without a parachute. Illumination radius is 185 yards and burn duration is about 10 seconds. They will do 1d burn damage a second for up to 10 seconds if in contact with something. Vision penalty due to darkness is -5 or the actual penalty, whichever is better. Flares are often loaded into the launchers of small patrol cybershells, allowing support units to be rapidly summoned and directed towards an intruder.